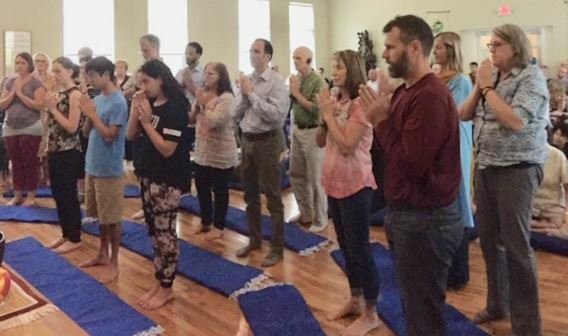 Thirty people joyously received transmission of trainings at three different levels March 17 at FCM's Tampa Center and made vows to follow the path toward compassion and awakening. "Today the community has gathered to give support to those who will vow to go for refuge to the Three Jewels and receive and practice the Two Promises, Five Mindfulness Trainings, and the Fourteen Mindfulness Trainings," our teacher Fred told the three groups. "You have had the chance to learn about and observe the way of understanding and love that has been handed down to us by teachers over many centuries," he said. Ten senior aspirants received transmission of the 14 Mindfulness Trainings in preparation for ordination to become members of the Order of Interbeing (OI) community, 17 persons received the 5 Mindfulness Trainings, and three young people made the Two Promises. 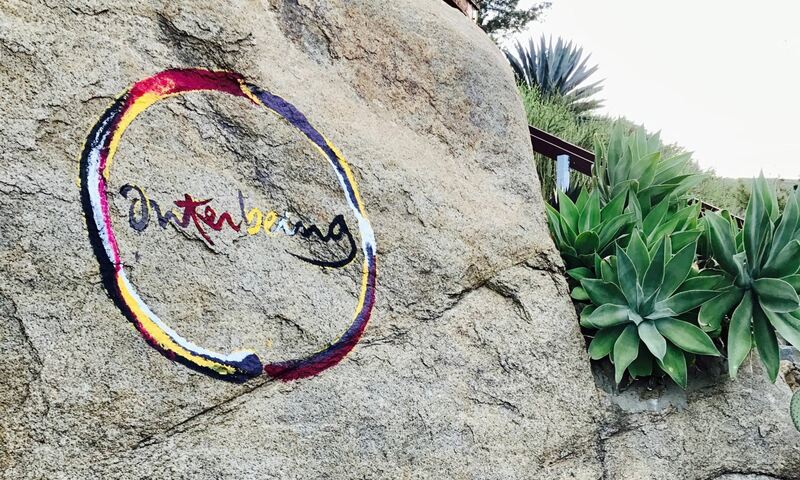 The Fourteen Mindfulness Trainings of the Order of Interbeing are expanded ethical guidelines that the members of the Order take as their aspirational lodestar for a life of understanding and compassion, the life of a bodhisattva dedicated to relieving suffering. Receiving OI transmission were Brandy Kidd of Naples, Chris Lee-Nguyen of Fort Myers, Beth Schroeder of Naples, Jan Kernis of Tampa, Diana Fish of St. Petersburg, Evelyn Haseman of Temple Terrace, Eleanor Cecil of Tampa, Lindsey McCaskey of Naples, Tony Pollitt of Naples and Maria Sgambati of Tampa. Their next step will be to receive full ordination later this year from monastics at one of the Plum Village centers in the U.S. or at Plum Village in France. At that point, they may wear the brown jackets signifying the humility of service to FCM, the Plum Village community and to sentient beings everywhere. In addition to the OI aspirants, 17 students took the Five Mindfulness Trainings as a public commitment to taking refuge in the Buddha, the Dharma and the Sangha. T hey were Bobb Hart, John Renner, Tracy Walter, Dana Mooney, Allon Bell, Maggie Tudor, Rita Greenspan, Misti Oxford-Pickeral, Teresa MatassiniFernandez, Ellen Mefford, Raven Dreifus-Kofron, Scott Nissensohn, Courtney (Cici) Claar, Mary Periard, and Jose F. Rodriguez, all of the Tampa Sangha; and Noreen Haines and Sheila Ludwig, both of the Naples Sangha. 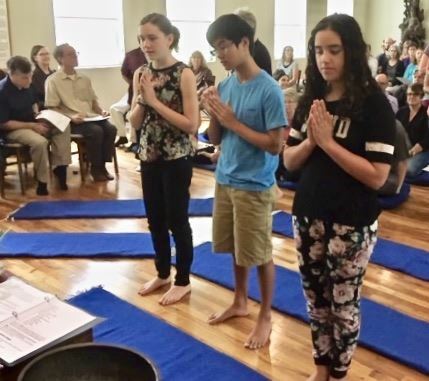 Three children/young people renewing the Two Promises were Sophia Cabra-Lezama, Emmy Stepp and Luke Dluzneski, all of the Tampa Sangha. Photo #1: Fred leads ceremony under watchful gaze of Thay (the Vietnamese word for teacher; Thich Nhat Hanh was Fred's teacher). Photo #2: OI aspirants do prostrations as they receive 14 Mindfulness Trainings. Photo #3: 17 adults receive 5 Mindfulness Trainings, take refuge in the Buddha, Dharma and Sangha, and receive their dharma names. Three young people, front row, left, renew their vows in the Two Promises. Photo #4: Fred gives certificate with new dharma name to Jose Rodriguez of Tampa Sangha. Photo #1 is by Nancy Natilson. Photos #2, 3 and 4 are by Sam Warlick. Fred, seated, center, leads transmission ceremonies before a packed house, while Bryan Hindert, left, serves as bell master. OI aspirants are at right. More than 135 people watch as 30 people receive transmission March 17. Fred explains the dharma foundation of the commitments being made in the ceremonies. Angie Parrish, FCM executive director, looks on at right. The Two Promises made by children and teens commit to develop deeper understanding and compassion -- big vows, indeed. One wrote in the application to renew vows that they wanted to renew their promises because they wanted to become a more understanding and compassionate person: "I believe it will help my relationships with people, animals, plants and minerals, and help my meditation practice." "I want to have a larger comprehension of understanding and compassion," wrote another. "I want to renew my vows to become a better person," wrote the third young adult. "The promises help me to stay on the path to be patient and grateful." As Fred said in the ceremony Sunday, "Go out there and show the adults how it's done!" Two new members, Noreen Haines and Sheila Ludwig, both of the Naples Sangha, were thoughtful about their reasons for taking refuge in the Three Jewels and receiving transmission of the 5 Mindfulness Trainings in a discussion after the ceremony. Both joined FCM this year. "Standing up in front of people and making a commitment to following the path makes it so much more real," Sheila said. "Also, there was something about the linking of Fred to Thich Naht Hanh that goes all the way back to the Buddha that struck me. They brought out a picture of Thich Nhat Hanh and put it on the altar, and I thought, 'This is kind of big'." A retired music teacher who spends part of her year in Naples and the rest in Medina, Ohio, Sheila said she was thrilled to find a sangha that offered community in Naples, where she felt "embraced." She has searched for a home sangha in Ohio, but hasn't been able to find one, so when she is in Ohio for the summer, she plans to stay connected to FCM during intensives via Zoom and to maintain communications with new sangha friends. Sheila has a cousin who is a Soto Zen priest and, for many years, has been discussing Buddhism with him and reading Buddhist books that he recommended, but at FCM, she found "the last jewel," she said. "I added sangha." Noreen, an avid hiker and massage therapist who spends half of her year in Naples and half in Salida, Colorado, said she can't imagine a life without helping others. She saw joining FCM and committing to the practice as an opportunity to get support while following that purpose. "It was a turning point when I heard Fred say that (Buddhism) is an easier way to live, and I thought that feels very practical. You need to figure out how to be present and awake and how to communicate to help people, and if somebody can help me understand that, I'm all about it. "I found this treasure (at FCM). Give me a shovel. I'm all about it. Give me more!" In a recent talk before the Naples Sangha, Andrew Rock of Tampa, FCM's OI Coordinator, and Nancy Natilson, OI member from Tampa, described the OI program as "connective tissue" that binds the community together. Nancy said the brown jackets work by ordained OI members are a symbol of humility, a statement that "we are here to serve you." OI members perform service tasks of all kinds for the FCM and Plum Village communities, with particular emphasis on sangha building. The Order of Interbeing was originally founded by Thich Nhat Hanh (Thay) in Vietnam in 1964 during the Vietnam war to provide support and guidance for a handful of his closest students and associates engaged in providing aid to their suffering people, often at risk of their own lives. Thay reopened membership in the Order 15 years later, and our teacher Fred was among the earliest of the new members. The OI includes both monastics and laypeople, and there are now thousands of members around the world, including 52 aspirants and ordained OI members in FCM, perhaps the largest OI chapter within a sangha in the country. In an informal discussion with the OI group last weekend, Fred described the history of OI, his own involvement with the opening up of the Order in the West and editing of Thay's book, Interbeing, and how he has emphasized OI's development as a "core community" within FCM, which strategically uses its cadre of lay volunteers to offer a wide array of services to its 300 members scattered up and down the west coast of Florida and, increasingly, into farther cities and other states, as well. Andrew orchestrated a symphony of OI members and aspirants and coordinated with selfless service volunteers and leaders in the FCM community to produce a retreat that flowed smoothly. Nancy led the catering operation for the retreat. Thanks to Andrew Rock, a member of the Tampa Sangha, for this article on FCM’s Order of Interbeing. On the morning of Sunday, March 17 we will have a wonderful and inspiring transmission ceremony for two groups at FCM’s Tampa practice center. Our teacher Fred will transmit the Five Mindfulness Trainings to a happy group of his students who are ready to make the public commitment of taking refuge in the three jewels of Buddhism – the Buddha, the Dharma and the Sangha – and to take the Five Mindfulness Trainings as the ethical guiding lights for their thoughts, words and actions. In addition, ten senior aspirants in FCM’s Order of Interbeing (OI) community will receive transmission of the Fourteen Mindfulness Trainings, expanded ethical guidelines that the members of the Order take as their aspirational lodestar for a life of understanding and compassion, the life of a bodhisattva dedicated to relieving suffering. The Order of Interbeing was originally founded by Thich Nhat Hanh (Thay) in Vietnam in 1964 during the Vietnam war to provide support and guidance for a handful of his closest students and associates engaged in providing aid to their suffering people, often at risk of their own lives. Thay, now resident at Plum Village Monastery in France although he is currently staying at his root temple in Vietnam, reopened membership in the Order fifteen years later, and our own teacher Fred was among the very earliest of the new members. The OI includes both monastics and laypeople, and there are now thousands of members around the world, including fifty aspirants and ordained OI members in FCM, perhaps the largest OI chapter in the country. As stated in the OI Charter, the aim of the Order is to actualize Buddhism by studying, experimenting with, and applying Buddhism in modern life with a special emphasis on the bodhisattva ideal. Aspirancy to the Order is opened in December of each year to members of FCM who have practiced diligently for at least two years, and are willing to commit themselves to service and to their healing and transformation for the benefit of all beings. Aspirants are assigned a mentor to guide their study and practice of the Fourteen Mindfulness Trainings and help them develop the skills and experience to serve as sangha builders. The diverse FCM group, like other OI members, is geographically diffused among the various FCM sanghas and beyond, but it has regular monthly Zoom calls to recite the Fourteen Mindfulness Trainings and to discuss how we can best serve our sangha and develop our practice. We have annual OI retreats; the 2019 FCM OI retreat will take place in Tampa next weekend and will include Sunday’s transmission ceremony. Fred, our teacher and respected elder OI brother, often says that the OI is the core of the FCM community because its members may be found serving the sangha in many ways, although Fred is always quick to point out that there are many deep and dedicated practitioners who are not members of the Order of Interbeing. But the Order is not only, or even primarily, a subset of FCM: the Order of Interbeing is an integral part of the worldwide Plum Village community created and led by our root teacher, Thich Nhat Hanh. There are also annual OI retreats at the North American Plum Village monasteries at Deer Park in California, Magnolia Grove in Mississippi and Blue Cliff in New York, and of course at Plum Village itself in France, where members of the Order, many of whom live in places where they may be the only OI member, gather to practice and renew their sense of community. In many ways the OI members, as well as the ordained Dharma teachers and monastics, are the “connective tissue” that holds the international Plum Village community together, particularly within lay communities such as FCM. Full ordination into the Order of Interbeing is conducted by Thay’s senior monastics – formerly by Thay himself – at OI retreats and at retreats of the bi-annual Plum Village North American tour for those aspirants deemed ready by their teachers, OI mentors and themselves. Once ordained, they receive a new Dharma name and a brown jacket to wear on ceremonial occasions such as transmission ceremonies -- not as a mark of attainment, (as the Heart Sutra famously says, there is nothing to attain), but rather as a mark of humility and dedication to a life of service. At the very heart of the Order of Interbeing are the teachings of Thich Nhat Hanh as embodied in the Fourteen Mindfulness Trainings, and in the profound insight that indeed everything is interconnected. More even than interconnected, we inter-are with all that is. We truly are not separate selves, and with that heart-realization come the compassion and love that power the members of the Order of Interbeing to commit their lives to deepening their understanding and service. The practices offered during the retreat and the confidence and authenticity of the Roshi sparked in me a sense of life flowing as both form and formlessness." “Mindfulness of the body in the body” is the First Establishment of Mindfulness offered by the Buddha in the Satipatthana Sutta. Mindfulness of the body is an entry level practice for beginning practitioners and a foundation practice for experienced practitioners for opening and sustaining each session of formal practice. In this retreat, the Roshi demonstrated to the participants, through very skillful guided meditations, how mindfulness of the body in the body can be a portal for mindful living, understanding Dharma teachings, and cultivating wisdom. Taking us step by step into experiencing our hands, he led us into noticing the difference between the experience of our two hands and the anatomical view of our two hands. The “inside” experience is one of formlessness, while the anatomical view that has grown out of looking at our hands from the outside is that our two hands are made of concrete elements, such as fingers, hair, and bones. Completing an exercise and listening to participants’ experiences of each meditation step, the Roshi would decide what to explore next. Taking us deeper into the experience of the body, based on the same foundation of deep awareness of our two hands, he led participants in practicing acceptance and gratitude for our bodies. He encouraged the participants to develop and hold the attitude toward the body as that of “our beloved.” He pointed out that because the body holds the imprints and summation of all our past experiences, embracing the body in this way heals all wounds from the past. Always starting with the simultaneous awareness of the two hands, the Roshi continued to take us through the hands, the face, the eyes, and the world around us to experience the formlessness of each phenomenon. This he said is the formlessness (emptiness) that is the subject of the chant in the Heart Sutra. Form is emptiness (formlessness) and emptiness (formlessness) is form. Neither one is negated or eliminated by meditation, but meditation reveals and allows us to experience the formlessness and change our relationship of attachment and grasping with regard to the form. Some participants shared experiences of feelings or views of the world that were reminiscent of experiences they had earlier in life, especially as children or young adults. The Roshi pointed out that since we are uncovering the clear reality of what we are and have been all along, such experiences from the past can be kinesthetic anchor points for what we are uncovering in the present and gives us confidence to look deeper. The Roshi cautioned that the profound openings and insights that came from our experiences in this retreat would fade and be forgotten unless we intentionally cultivated and applied our insights in life off the cushion. He shared that in square dancing with his wife they had learned more than 200 different movements that could be performed in different combinations. These movements, which are the basis for a smooth and enjoyable performance, must be taken to dance floor and practiced continuously to retain them and to be proficient. So the participants of this workshop must continue to practice touching the formless to know it clearly and to reflect on how its presence changes our understanding and approach to the formed, i.e., the conditions of our body and the views, stories, and attitudes of our mind. As I reflect on the personal impact of this retreat, I can feel something was stirred in my consciousness, the formulation of insight, but at this time it is not complete. As I write this, I see that insights come from the formless and their arising is known by a feeling. Conceptualization comes later. From past experience, I know that if I cling to the conceptualization of an insight, I stop the unfolding and get stuck. Holding an insight loosely and examining it by looking into the feeling, allows the insight to deepen and evolve. The practices offered during the retreat and the confidence and authenticity of the Roshi sparked in me a sense of life flowing as both form and formlessness. Also the boundaries and barriers we experience in ourselves and in the world are constructed (imagined) and can be deconstructed. The retreat confirmed for me the closeness and straightforward presence of truth that all of us can readily experience when we open and dissolve the boundaries of what we think is true. Compassion and connection are also experienced through the opening of these boundaries. As the Roshi foretold, these exercises brought memories of past experiences when I was especially concentrated and open and could sense a deep connection with my surroundings and the people present. At these moments, I felt in perfect harmony with all that was happening, knew exactly what action was appropriate, and felt free to act. These moments were no accident, but at the same time they were not created by thinking about them or planning for them. I bow with respect and gratitude to Roshi Hogen Bays. 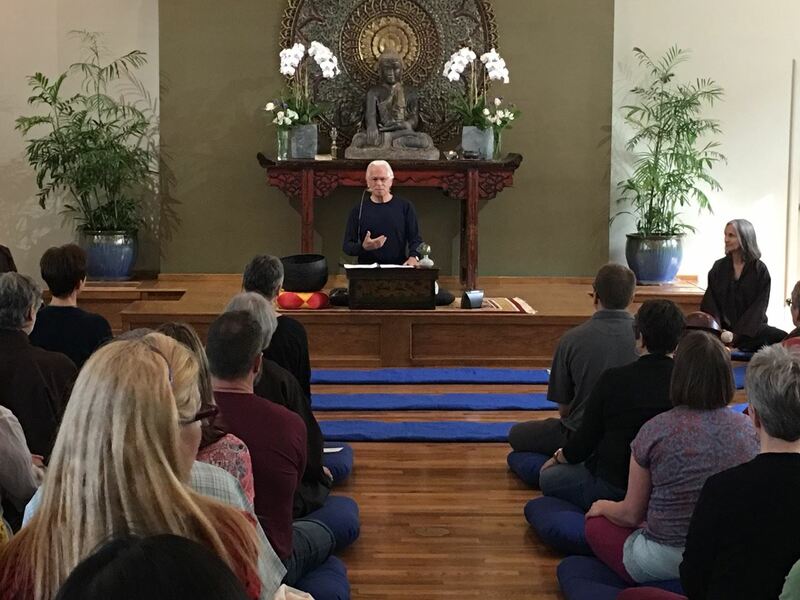 EDITOR’S NOTE: Roshi Hogen Bays offered a retreat on March 1 and 2, 2019, for “open minded practitioners who are interested in exploring their identification with the body” and “stepping into the Great Mystery.” A group of 70 practitioners ranging in experience from beginners to those with many years of experience undertook the journey. The Roshi was a Dharma brother of our teacher Fred as they began their Dharma study together under Roshi Philip Kapleau at the Rochester Zen Center in 1968. Both left the Rochester Zen Center in 1975 to continue with Dharma study and practice on separate paths. In recent years Fred re-established contact with the Roshi and invited him to visit FCM and offer teachings. Roshi Hogen Bays is the co-abbot with his wife, Roshi Chozen Bays, of Great Vow Zen monastery near Portland, Oregon, and has been a leader in the Zen Community of Oregon since 1985. As you can imagine, this negativity and resentment perfumed our other interactions, and dishes became this symbol in our marriage of my not feeling seen, heard, or responded to, left to take care of things myself. In short, I was feeling neglected and taken advantage of. But prior to Selfless Service, I couldn’t see that, at least not so clearly. All I saw was pain and frustration, well practiced over almost a decade. He acted out his role and I acted out mine, both to our detriment. I’m choosing to clean these dishes to care for my family because I love them. I’m very skilled and efficient at this task, and I’m glad to use my skill to help out. I can clean these dishes mindfully, and practice finding joy and peace in this ordinary task. Dishes aren’t inherently stressful. The stressful part was the story I told about it. I stopped carrying anger and resentment about cleaning dishes, or doing any other chore for that matter. Cleaning times were now an opportunity to cultivate peace and joy in myself to ripple out to my family. I saw the positive effects that having a clean home had on the well-being of the people in my house, and I want my family to be well. I now clean happily so they can be well. I have deep gratitude for the opportunity to continue practicing at Selfless Service work mornings to reinforce these patterns and would recommend it to anyone. These mornings do not feel like a morning of chores. They feel like joyful mornings with community, caring for the Center and each other, and learning about ourselves through practicing mindfully. 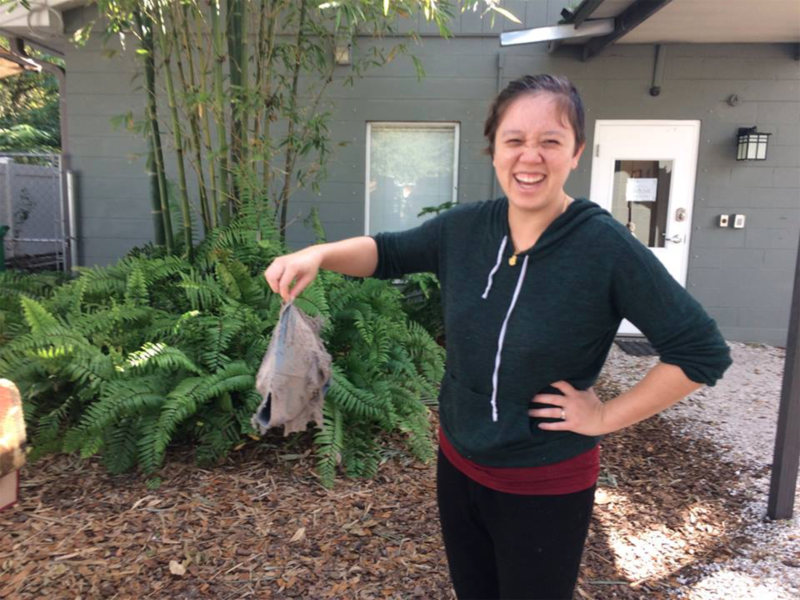 Dana is a member of the FCM Tampa Sangha. 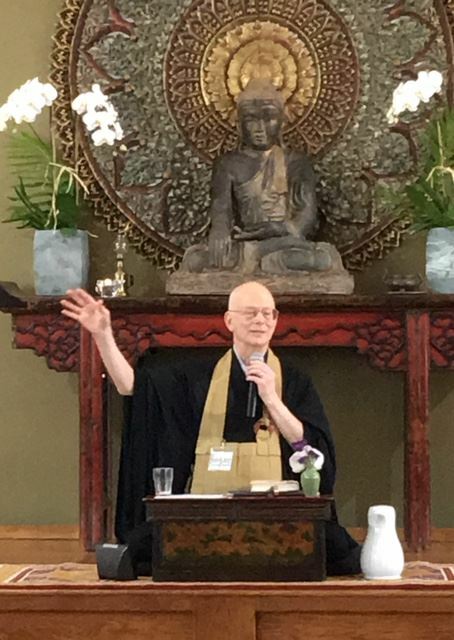 Beth Schroeder, Naples Sangha member, writes of her experience of the recent retreat and Sunday dharma talk at FCM by Ben Connelly, visiting teacher and priest at the Minneapolis Zen Center. It’s a youthful, fun, easy-going word -- just like Ben. He brought this attitude to us as a guest teacher from the Minneapolis Zen Center as he taught the Dharma using the “Song of the Grass Hut Hermitage” poem as a template. He is also the author of the book, Inside The Grass Hut, which deeply explores the poem’s meaning, line by line, showing his love for the poem with careful analysis and discoveries that he shared. We followed Ben in exploring how this little 1,300-year-old poem written by a monk living in a grass hut on a rock -- an impermanent dwelling in which “no one of importance” lived calmly and happily teaching the dharma to others -- could be so important in the 21st Century. Cool also is a word used to describe jazz. Ben, also a jazz musician, used music to help us understand how to listen, connect and be with what is. Music has many subtleties and layers to its meaning. Music/sound/vibration speaks to me almost as much as visual art. So it was a delight that one of the first things we did during the retreat was chant the entire text of “Song of the Grass Hut Hermitage.” We chanted it again several times during the retreat, following Ben’s resonant tones. Read, let it sink in and then reflect, he told us. First, read the poem/song, letting the words wash over us, not striving to understand them. Next, allow the blended sound of our voices to penetrate our bodies, then read it both softly to ourselves and then allow one phrase to bubble up in our awareness. Then, we were asked to examine that phrase. For me, words crystalized and feelings followed, allowing an easy connection to the ancient wisdom. It all became very fluid as he directed us to notice how it felt as the sound flowed through our body, mind and consciousness. “Remember to feel,” he reminded us. “Emotions are part of the experience.” He pointedly directed us to not leave anything out. “Let yourself be immersed in it,” he said. More than 2,600 years ago, the Buddha exhorted his senior bhikkhus, monks with the responsibility of passing his teachings on to others, to train their students in the Four Foundations of Mindfulness. “What four?” he was asked. The brilliant way Sensai Ben led us into deep Dharma was inspiring. He said things like “Let go and loosen the thought,” helping me to cling less to the intellectual and engage my body, mind, feelings and consciousness more fully with the wisdom of the song. We came back to this theme many times during the retreat -- when chanting, when sitting, when eating, when doing anything -- let yourself be immersed in it, have a relationship with it, let yourself be steeped in the practice (like a tea bag steeping in a cup of water). Today we live in a culture that leads us away from significant immersion. We are privileged, lucky and wise to have found a path that leads us to connection and liberation from the damage our culture can inflict. Ben reminded us the very first night of the retreat to take care of our Buddhist lineage. To take care is a sacred action. By hearing these very words, and allowing them to merge with our being, we come back to this sacred path and the great line of Bodhisattvas who stepped onto it eons ago. Our actions bring the practice and lineage into this world and the evolution of how we will evolve as a species, as a world and as beings. It is doubtful we will retreat as Shitou did -- more likely we will stay in the midst of it all. However we look at it, we are part of it. We are in it. When we practice for ourselves, we practice for others. We inter-are. We are part of Shitou now, we are part of the chant, we bring it to where we are with it in each step. Awesome, yeah, and daunting. We have the Three Jewels (Buddha, Dharma and Sangha) as our vehicles. With the Sangha we can travel on a true path and support each other. Ben brought us his warm, light, wise Dharma touch traveling from chilly Minnesota. We may only need to walk to the mailbox and say good morning to the post person to continue this great gift of Dharma he brought to us. But when we walk with the lineage in our hearts, we take the dharma transmission with us. Who knows what effect it will have, but it certainly deepened my understanding of how to practice the Dharma in my little hut off 3rd Street North in Naples. It’s all cool, right, Ben? Hope you visit again soon. Beth is a professional artist and art teacher whose paintings on silk scrolls grace the FCM Meditation Center in Tampa. Thanks to Carol Green, Naples Sangha, for this article about the Winter retreat on mind training, written just before the beginning of the Spring Dharma Path Intensive studying mind training, or Lojong. Our minds are going to think, no matter what we do. So why not use that amazing, mysterious capacity to build a wholesome, happy life, rather than an unhappy, uneasy, frazzled one? Sounds simple, doesn’t it? That was the theme behind the winter FCM retreat led by our teacher Fred. He even named the four-day event “Mind Training: How To Use the Thinking Mind to Support Your Transformation (Rather Than Sabotaging It! ).” Throughout the retreat, he drilled the challenge home: Become aware of what is in your mind and act on your ability to mindfully choose what your mind is thinking. Right on, Brothers and Sisters! I can take the steering wheel of my mind. Whoa, this is a Big Deal! Fred told us to learn the difference between reality and our thoughts about reality. We were sitting at 6:00 am in pre-dawn light of the Franciscan Center shivering in the chill when we could have been snoozing under a warm blanket and I forgot to put on my socks, and my feet were cold. This was my reality. If there was drama, it was our fabrication, he told us. (Yep, I dramatized it). My Storehouse Consciousness thought this chilly sleepiness was real and projected barriers, blew up a big deluded balloon of a Self, and didn’t want to meditate. This Self was a Trickster, the Joker of King Arthur’s Court, the Kokopelli of the Navajo. Its role was to continue to create problems. It popped up at the most inopportune times. I looked this Self over. Not pretty. This is why mind training is so important, Fred reminded us. When unwholesome, negative or distracted “stuff” arises, if we use mind training -- plus mindfulness and awareness -- we will see our thinking is distorted and can change our thoughts – and thus our emotions. If we are mindful, we can see the “stuff” when it is arising and make choices. Mercifully, my mindfulness returned. I saw reality: It was simply 30 minutes before dawn beside the Hillsborough River and I was sitting in a room with 40 friends trying to wade through the morass of Self and Distortion and find Calm. The irony was that Calm was sitting right there on a peaceful morning. S – Stop it! Tell yourself you have had enough. Simply order yourself to “Stop it!” Stop thinking the unwholesome, negative thought that causes you to suffer. And finally, Fred threw in one last helpful suggestion. As you consider the thought that is causing you to suffer, ask yourself: Are you sure? Is it (this thought) true? FCM offers a Death And Dying Program, including end of life transition support. Under our Dharma teacher Fred Eppsteiner's oversight, a team of FCM members, who have previous experience in the area of death and dying, recently completed training to become death doulas. FCM’s death doulas assist members who are dying or who are caring for a loved one who is dying. Through their mindful presence and experience with the process of dying, they offer support and helpful information through home visits, and upon request, guided meditations to calm and stabilize the mind of the dying person. Thanks to Fran Reilly of the Naples sangha, a member who recently completed the program and now shares her experience of FCM’s death doula training. When the idea of learning to become a death doula was first discussed with me, I had two reactions – excitement and intimidation. Yikes, what does that mean exactly and what would be expected of me? I was both excited to have this opportunity to work with Fred and other team members to learn more and at the same time intimidated at the prospect of becoming a death doula. Trusting in my Buddhist practice and knowing that life is impermanent – that we all die at some point, never knowing when -- I decided to make the commitment. Over the course of the past five months I have been part of a core team of 10 FCM members enrolled in death doula training. I knew from the outset we would be called upon to look closely at our capacity to face our own deaths and that of our loved ones. Of course that makes sense: If we haven’t faced our own fears, how could we have the stability and clarity and the ability to bring benefit, guidance and support to others? So, we have been sharing reading materials and other resources, discussing, learning from Fred and each other as we follow through with our commitments. Early on we learned that our focus as a death doula would be to act as personal coach, a support and guide to help the dying person with their aspirations. We would learn to offer practices to reduce worry and fear and help the person stay grounded and as present as possible. We would not act as social workers or hospice personnel because there are many other services available in the community. Our core job would be to benefit the other person and family in their time of need. Clarifying our role helped me to have more focus and encouraged me to keep learning about the many practices that are offered in our tradition and avail myself of the wisdom teachings that are here for all of us. The Buddhist perspective on death is one of transition. Fred helped us understand it is a journey. I appreciated the transition analogy because it is easy to understand from this perspective. There is a continuity of consciousness so our mind state at the moment of death and leading up to death is important. The body is dying and the mind, as a stream of consciousness, is entering the world beyond birth and death. We discussed and shared many of the sutras, chants and practices that can help create a wholesome mind state during the dying process. Through these past five months I’ve come to appreciate all the resources we have through our community and each other. I am not the only one who is going to die, I am not the only one who is going to lose a love one — this is the reality of life! As I open my heart, willing to let go of self-centered fears and to become open to the spaciousness beyond, an ease permeates my being. I have also been inspired to focus on taking care of my own advanced directive, getting my mind clear regarding my own transition, and having the family discussions that are important for all of us. I realize it is an ongoing process, a lifetime journey, and I continue to learn each and every day. We are fortunate to have so many heart-centered practices, meditations, chants, and books to support our learning. And most of all, I am grateful for my Sangha brothers and sisters who inspire me with their efforts and open hearts, and our teacher who inspires and guides us along the way. On the retreat grounds before dinner on our first day, I walked the labyrinth’s outer circumference. I didn’t take the time to proceed inward toward the center. But after the retreat, I thought of my movement around the outside of that circle a lot, after Fred challenged some of us to consider if our Buddhist practice was marked by “movement, but not progress.” That description seemed an apt, albeit uncomfortable, way to describe my own practice. For five months prior to this retreat, I’d honored a personal commitment to increase my involvement with the sangha and to deepen my practice. But by the retreat’s end, I realized I still had not been doing enough to progress along this path. I was still looking “for an easier, softer way.” This weekend provided the time and space for me to finally examine some of my self-created obstacles. First, although my practice had recently become my highest priority, my other interests, including some volunteering and research for a book, were eating into my formal meditation time. It seemed very clear now that to develop the concentration skills and habits of mindfulness I needed to progress, I must devote more time and attention to my practice than I had planned. I decided to relinquish indefinitely some of my other time-consuming pastimes. Second, although I had been reading a lot of Buddhist literature, I felt stuck in my meditation practice. I was a little bored and not finding meditation very satisfying. I had begun to think I just didn’t have the meditative chops to do this right, or well enough. During the retreat, we spent many hours in guided meditation that reignited my curiosity about, and interest in, the contents of my mind. The result, so far, has been a lessening of my impatience, an increase in energy, and greater enjoyment of formal meditation. Finally, I recalled that I never had an ongoing mentor or teacher in my personal, academic, or professional life. My resolute self-reliance reminded me of a grandchild insisting she could tie her shoes by “me self.” I acknowledged to Fred in a small group that I gave up trying to do this alone — and needed his help. Fred and I have since met and I’ve also asked a senior practitioner to help coach, encourage, and challenge me. I was reminded of how much of meditation is about remembering. During formal meditation, of course, we remember to return to the object of meditation. In my case, the larger challenge occurs off the cushion: remembering to be mindful in the first place, remembering to slow down, and then to stop. Lately, I’ve focused on my drive times -- especially difficult occasions for me to remain present. Fred, Angie, and Bryan reminded us during the retreat to protect our mindfulness practice from incursions of thoughts about the past and future. It was useful to notice that my most troubling future thoughts were about all four pairs of the eight worldly concerns — and not just one or two of them. Thoughts about gain or loss, or praise and blame, for example, were so potent because each pair was accompanied by both fear and hope. Once I’d identified these recurring thoughts, I found these concerns easier to interdict at mindfulness’ gate, before they had a chance to get a running start. The most far-reaching result of my retreat was the wake-up call to confront and close the gap between my stated aspiration for my practice — and the time I’d set aside to fulfill it. Rather than feel discouraged by this realization, I feel enthusiastic about embracing a more realistic view of the work ahead. I'm sitting a couple times a day now, and for more extended periods. Formal meditation has begun to feel more interesting and much less like a chore. With increased frequency, focused presence occurs earlier at the beginning of each session; and at sessions’ end, I feel more energy — instead of less. ·Although I’ve been able to enjoy shamatha for some time, during the retreat my concentration practice seemed effortful and inconsistent, perhaps because my breathing is shallow. So I am setting aside more time than in the past to just counting breaths. Since the retreat, I am focusing more attention to my informal meditation. Every 15 minutes my phone invites the lovely sound of a new re-mindfulness bell. Walking the dog is more a more effective meditation practice now that I stand still to “turn on the mindfulness switch” before opening to choiceless awareness. Despite no professional connection to or background in the climate change issue, I’ve felt a strong calling to get involved. But with a lack of expertise and living on a small island near the tip of Florida, what real difference could I make upon this massive global issue? But the reality of global warming was hitting too close to home to ignore. Our little island was one of the first and most impacted towns hit by Hurricane Irma. Two of our neighbors’ homes had to razed and we sustained over a foot of water in our garage. The ongoing toxic proliferation of both red and blue/green algae blooms has seen our beaches littered with dead marine life and the subsequent economic, environmental and health fall-out. So despite this lingering feeling of hopelessness and impotence, when the opportunity arose to be in San Francisco during the Global Climate Action Summit (GCAS), I booked my flight. The experience turned out to be far more rewarding and inspiring than I could have imagined. Through information gleaned from my sangha friends at the Florida Community of Mindfulness, I was introduced to GreenFaith, a global interfaith coalition of religious traditions sharing concern for the planet. I contacted them and they immediately put me to work making phone calls to various Bay Area religious organizations soliciting participation in the RISE UP for Climate, Justice and Jobs March. As a volunteer parade monitor, on a beautiful cool sunny morning, I escorted a spirited yet respectful 30,000 person-strong contingent down Market Street in a united show of concern and action. The week ended on a quieter more reverential tone with an all-day symposium entitled “Loving the Earth,” held at Spirit Rock in the pastoral hills of West Marin, a fitting finale to this life-affirming week. In between, I attended numerous activities mainly organized through GreenFaith and Interfaith Power and Light. The official GCAS conference was reserved for high-ranking government officials, climate experts, policy wonks, businessmen and environmental advocacy groups but free affliliated events and seminars were happening all over the city. One in particular was an all-day forum entitled Women’s Assembly for Climate Justice, which highlighted the moving stories of tribal and indigenous women leaders and the tactics they are using to halt the takeover and destruction of their sacred lands primarily for fossil fuel extraction. There was focus throughout the conference on these proud bearers of traditional culture and wisdom who are leading the movement to reclaim Mother Earth's rightful place as provider and protector. One evening, there was a powerful multi-faith service at Grace Cathedral featuring a grand procession, uplifting music and thoughtful words from clergy representing all the major religions as well as emissaries from the Holy See and a livestream shout-out from H. H. Dalai Lama. The universal message was clear -- it is our duty as people of faith, as caring communities that respect and honor the sacredness of Planet Earth, to stand up, speak out and actively work for her survival. I chose to participate in these faith-sponsored events because it’s become increasingly clear, that for me, any activism must be steeped in the grounding of mindfulness. It is only now, with my deepening practice and the inspiration of so many, do I feel prepared to face my fear and consciously turn towards it… to move beyond paralysis into a place, a space, of well… healing. Joanna Macy, Buddhist lioness and environmental activist, spoke of fear as only one side of a two-sided coin, the other being love. They are inseparable. By confronting one, I am touching the other. This can be my practice, my “living on the razor’s edge,” as Kristen Barker of One Earth Sangha likes to describe it. This was the resounding message of my week… it will take a community, a powerful congregation of like-minded individuals to turn this tide. Not just the dedicated folks of Plum Village or Florida Community of Mindfulness or Marco Island or the US, but a global awakening, a slow but persistent shift of consciousness, a world Sangha… and, as our teacher Fred reminds us, the inner peace, strength and love that is required starts with me. With gratitude to Bryan Hindert for this article, which was originally published in the Plum Village publication, "the Mindfulness Bell." Please consider subscribing to the Mindfulness Bell to help support our greater Plum Village community. Visit www.mindfulnessbell.org/subscribe for more information and to subscribe. It was a moment of connection across generations. I smiled. At the end of a recent retreat with the Florida Community of Mindfulness (FCM), a sangha in the spirit of Thich Nhat Hanh based in Tampa, a fellow Wake Upper shared an insight during closing circle. He was surprised to learn that some practitioners older than forty were dealing with many of the same issues that challenged him and his Wake Up friends. The seeds of aspiration to build a sangha where members of all generations could connect, learn from each other, and see they aren’t so different after all were beginning to bear fruit. I began my own Dharma journey with FCM, an all-inclusive sangha. In 2013, my teacher, Fred Eppsteiner, the founder and Dharma teacher of FCM, encouraged me to find a way to help young adults who came to our practice center to connect with our community and to the Dharma. In all honesty, I was not thrilled. I had been practicing with FCM for a few years and was quite happy being one of the only two or three really engaged young adults in the sangha. Although I had been making significant transformations in my life and had healed much of my own wounding and mental suffering through the practice, looking back, there was a whole area of life I was avoiding because of the pain it often brought me. Due to various causes in the past, I would go into a comparing, jealous, and self-critical mind-state when I was around other young adults. The idea of spearheading a group to invite more young people into our sangha felt counter-intuitive, to say the least. Luckily, I had learned through practice that listening to my thoughts was risky business, and Fred had taught me that to grow in the practice we can’t be afraid to get uncomfortable. Thus, with Fred’s guidance, and a bit of a nudge, Wake Up Tampa Bay was born. Before we had our Wake Up group, young adults would visit FCM, but they would usually come only once or twice, and then disappear. Once we started having a Wake Up meeting every other Friday night, when young people would come to the sangha, I or one of the other younger members would personally welcome them and invite them to our Wake Up group. 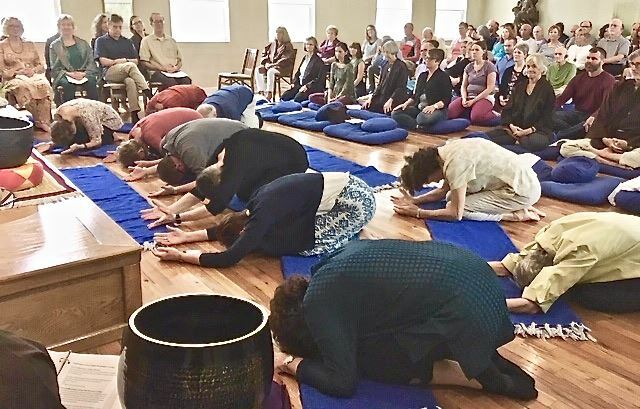 It became clear that the ability to connect with people their own age was a key factor in whether young adults continued to come to sangha gatherings. Over time, our Wake Up group grew from an initial three members to twenty to thirty participants, a thriving community of young adults supporting each other in living wholesome, mindful lives. In addition to our Friday evenings, we also began having our own Wake Up Days of Mindfulness, Wake Up Dharma study and practice groups, regular social activities, potlucks, nature walks, and many informal events. In one sense, it seemed that FCM was becoming a more age-diverse sangha. In reality, however, two separate sanghas were beginning to emerge. In the early days of FCM, most of those who came to Wake Up Tampa Bay were also interested in participating in the activities of the broader sangha. However, as attendance grew, a shift began to happen. More and more, the young adults who came to Wake Up seemed satisfied with the peer support and did not seem particularly interested in attending gatherings of the broader sangha. Rather than being an extra support to younger members in our community, Wake Up had become, in a sense, an island unto itself. While it was wonderful to know that a community of practitioners had developed that nourished and supported mindfulness practice in young adults, it seemed that both Wake Up and FCM were missing out on an important connection by this bifurcation of the sanghas. To me it seemed that our Wake Up community had much to gain from the wisdom and experience of the older, more seasoned practitioners, as well as an opportunity to deepen our practice through the many Dharma programs and the connection with a teacher that FCM offers. Likewise, FCM could benefit greatly from having the youthful energy of Wake Uppers join in their activities. It was also striking that our sangha, while professing to offer an alternative path to the unwholesome elements of our culture, was, in a certain sense, mirroring the division and separateness we often find between different age groups in society. Thus, with Fred’s guidance, a few of us Wake Up organizers began a concerted effort to integrate the two divergent groups. While the first few years of Wake Up were aimed at creating a space where young people could come to heal, transform and support each other in mindfulness and meditation, these past few years have been more focused on integration into the larger FCM community. Our intention has been to create a unified, truly age-diverse sangha that offers both peer support for the Wake Up group and the experience of seasoned practitioners. To foster this integration, many initiatives were experimented with, and much consistent encouragement, creativity, and patience have been needed. There are signs that the fruits of this effort are blossoming as more Wake Uppers are now participating in much that FCM offers. For instance, at our recent sangha picnic and at our last tea ceremony, we had about as many Wake Uppers as non-Wake Uppers in attendance. We also now have about thirty Wake Up-age participants who have become formal members of FCM. With close to 300 FCM members in total, this is still a small percentage, but we have come a long way from the original three young adult members. We are also beginning to see a good representation of Wake Uppers at our weekly Sunday sangha meditations and Dharma talks, and many are beginning to take part in more of the intensive Dharma programs that FCM offers, working with mentors, and taking advantage of having a Dharma teacher to guide them in their practice. Perhaps most telling, this year we had two Wake Up members take on leadership roles within the larger FCM community. We in our Wake Up group are maturing in our practice and there seems to be a real thirst for deepening our study and engagement with the Dharma. Also, as more Wake Uppers are getting to know the older practitioners in a deeper way, there appears to be an eagerness to explore further ways of connecting with them. Last February I had the opportunity to meet several other Wake Up Ambassadors at a Wake Up Care Taking Council Retreat at Deer Park Monastery. In our discussions during the retreat, I learned of the many ways that Wake Up sanghas are watering wholesome seeds in young adults and helping them to heal their suffering, cultivate joy, be of service to others, develop leadership skills, and begin their journey on the path of Dharma. What also became clear in our discussions was that the division that FCM had experienced between its Wake Up group and the broader sangha is the reality for most of the Plum Village sanghas in North America, rather than a special case of our Tampa Bay community. Although our experience in Tampa may be somewhat unique, since our Wake Up group was born out of our broader sangha, perhaps it may be helpful to share what we learned in the experience of integrating our two groups. I believe it is in the best interest for the entire Plum Village community to integrate these two sangha streams, and it takes consistent effort from both ends to make it happen. Host regular “meditations and mixers” where we invite older practitioners to spend an evening with us in meditation, deep sharing, and communing over tea. Invite our Dharma teacher and more experienced practitioners to offer Dharma talks and answer questions about practice at our Friday Wake Up meetings every other month. Discontinued separate Wake Up Days of Mindfulness and instead are encouraging attendance at FCM Days of Mindfulness. Schedule fewer Wake Up only social events and are encouraging attendance at FCM social events. Organize Wake Up hang out time after an FCM activity, such as a work meditation day, giving us the space to connect with our peers while also participating in FCM events. Organize community involvement activities such as volunteering at a local community farm and invite the broader sangha to join us. I encourage my fellow Wake Up organizers to consider the importance of integrating our Wake Up groups into the broader sangha for the health and well-being of the Plum Village community. Although the initial development of separate Wake Up groups has allowed the space for young adults to experiment and find their own connection to the practice and lineage, the broader sangha needs our energy, creativity, and excitement for the practice in order to continue beautifully into the future. Our Dharma teacher and experienced practitioners act as close mentors in practice and sangha-building for our Wake Up organizers. We have a monthly “Tea with the Teacher,” giving Wake Up-aged members of FCM a chance to seek Fred’s guidance in an informal setting. Experienced practitioners in FCM lead Dharma study groups to support Wake Uppers interested in going deeper into Dharma teachings and practice. Older members of the sangha invite Wake Uppers to dinners, teas, and other informal ways of connecting. In general, I would also encourage all-age sanghas to understand the need of young adults to have space to support each other in the practice and experiment with how to bring the practice into their lives. I encourage giving young practitioners a chance to take on responsibility in the sangha and, when ready, to take on leadership roles. When young adults are given this opportunity, I believe they both step up to the occasion and take more ownership of the sangha. From a personal perspective, these past five years of sangha building with Wake Up and FCM have helped me to untie many internal knots and heal emotional wounds I had developed around interacting with my peers. The act of doing something meaningful in my life while taking care of and transforming my suffering has allowed me to feel whole again. I now enjoy spending time with both younger and older people equally and have many Dharma friends of all ages. Through this experience, Fred has taught me to set aside my personal preference and to instead do what is most beneficial for the sangha, and what is most beneficial for beings. In putting aside my personal preference, I have also found a truer happiness and well-being than I could have ever found from staying in my comfort zone.